Kasco Aerators are affordable, reliable, and dependable. Known as the industry standard, Kasco units are made of stainless steel which makes them saltwater compatible. Kasco Aerators are designed to move high volumes of water exposing more surface area to the air for gas exchange. 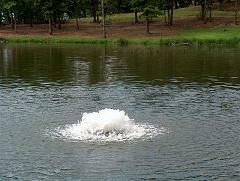 Destratification releases toxins and injects much needed oxygen into your pond. Increasing & Maintaining oxygen levels will give you a healthier, more productive pond. Reducing a risk of turnover and protecting your investment. *Coverage - 3/4 to 1 1/12 acres, depending on stocking densities. *Coverage - 1 1/12 to 3 acres, depending on stocking densities. *Coverage - 1 1/12 acres and over, depending on stocking densities.